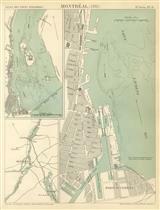 Description: The island of Montreal and its environs. Published by J.N. Bellin, the first Hydrographer to the French King. Coloured. Description: Unusual and early plan of the city of Montreal in Canada, the last stronghold of the French during the French Indian War. Coloured. Description: Montréal. Map showing the plans and development for the parishes, villages, roads and the route of the Lachine canal (completed 1824). Presented in French text and printed colour. Description: Three maps on one sheet showing the city of Montreal in various levels of detail, concentrating mainly on its port. Printed colour. Description: Extremely rare folding plan of the island and city of Montreal published for the Dawson Brothers. Printed colour. Folded. Description: Miniature city plan of Montreal including ferry routes. printed colour. Description: Tourist plan of Montréal, highlighting landmarks, institutions and transportation routes. Printed colour.